The Democrats on the Erie County Legislature picked one map. 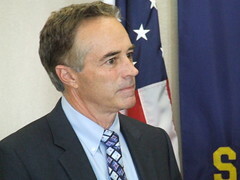 Chris Collins doesn’t like it. He liked another map. The Democrats don’t like it. So Collins vetoed the Democrats’ map, and the veto override vote is likely to take place sometime today in the legislature. Of course, what should have happened is we should have had not a bipartisan – but a nonpartisan – commission made up of academics and professionals to help draw new district lines. What we had was political appointees who had marching orders and acted as proxies for larger interests. Assuming the veto cannot be overridden (there aren’t enough votes, regardless of whether any Democrats align themselves with the Republican minority), the legislature has a big problem. The thing is going to go to court regardless of what happens, but don’t forget that the voters overwhelmingly voted to reduce the legislature from 15 to 11. Now what happens with that? It’s my hope that the legislature is dissolved by default and we can go back to the drawing board and create something less horrible to serve the people. After all, 90% of their work is rubber-stamping and 10% seems to involve temper-tantrums. I guess we’ll find out this afternoon.